All Madico Auto Films are contour engineered™ for easy heat shaping to dual curve windows. All Madico Auto Films we carry have a limited lifetime warranty and come with a tough, scratch resistant surface. The nomenclature number represents the visible light transmission (VLT) or the amount of light that passes through it. So, the lower the number, the darker the film. Darker films reduce more glare but may get you a ticket from local law enforcement. Tint Laws vary by State. Onyx is a metallized, high performance film designed for a jet black look & high heat rejection. Madico’s Onyx auto tint combines classic looks with contemporary functionality to deliver a high quality, top-of-the-line auto film. Onyx films offer exceptional heat rejection and increased passenger privacy while reducing dangerous glare. In addition to a cooler more comfortable ride, Onyx provides a high level of fade resistance to help keep your interior looking new, for years to come. This premium level, 2 ply film is the professional’s choice for quality, looks and conformability. Another Madico first. This film has no surface or adhesive dyes, like conventional non-reflective auto tints. This professional level, 2 ply extruded film has the pigments impregnated throughout the thickness of the film. This allows the film to retain its color, while dyes tend to vaporize and fade over time. The extruded polyester offers a rich color with a unique non-fade, non-color change warranty. 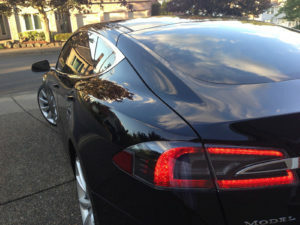 This is our best-selling Automotive Window Film. There is no metal in this film to interfere with electronics. Black just got blacker with Madico Black Pearl. Great looks at a bargain price. Black Pearl NR allows value conscious installers to use a professional level film brand that costs the same as some of lesser brands out there. Installers appreciate that it is a 2 ply film, so it is robust and easy to work with and that it also matches many factory tints. We offer the Non Reflective version that does not interfere with certain satellite, cell phone, or GPS devices. Why drive a high end vehicle and then buy a low end tint? This revolutionary, premier film is not like ordinary window film. WINCOS is designed to absorb infrared heat. Is your tint doing that? This film is designed to look great in lighter shades, while stopping more heat than you could stop with traditional, darker films. WINCOS is ideal for states with strict, lighter tint density laws or for that customer who does not want dark tinted glass to gain better sun protection. WINCOS is available in a wide range of densities. Almost all of WINCOS films reject 90% of the sun’s infrared heat, even with the 60 and 70% film! The 70 and 90% are both legal for windshields for people suffering with certain health conditions, giving them welcome relief from the sun. Wincos technology does not interfere with electronics. Save time, save labor and tint more vehicles per day with our computer cut tint kits! Getting more tinting done in less time means more profit for you. We are excited to be able to offer our customers the advantage of having precision cut, Automotive Tint Kits. These are drawn using sophisticated software and with the click of a mouse, an entire vehicle’s window patterns are cut for you, on our Roland Plotter. Every window is available, from the side vent windows on an Extended Cab Pickup to a full windshield on your family sedan. Only a computer and plotter can cut radius curves like this for that seamless, professional look. You never have to touch the customer’s car with a sharp knife, ever again. We have over 4,000 window film patterns, dating back to 1990. When you order, shades and densities can be mixed on the same vehicle. Pricing for the kits are available in the Dealer Portal page. Most kits are shipped the same day you order them. This cutting system also allows us to cut Automotive Paint Protection Kits! The conformable clear film that goes over the painted surfaces of the Hood, Bumper, Mirrors and fender fronts has become a major addition to the window film business. PPF kits allow you to order just the parts that your customer is looking to have covered. We have over 35,000 different PPF patterns in our system. The system will also allow us to cut vinyl lettering, and graphic films for company logos, and other vectored artwork for your business or customer. Custom cut logos, vinyl signs, banners or magnetic signs can all be done, in house! Call today to find out how this investment in technology for us can produce dollars of profits for you. Madico’s Invisi-Film is a 6 mil thick, clear paint protection film. It is made of flexible urethane, designed for exterior application on automotive painted surfaces. Its self-healing properties make it the superior choice among paint protection films. Strong, repositionable adhesive and stretchability result in a user-friendly PPF that is fast and easy to install. Invisi-Film comes with a siliconized liner for smooth cutting and works with computerized plotter systems, such as the MACS system, to provide a custom fit. Invisi-Film is also manufactured with a “cap sheet” to protect the film during shipping and storage. Available in 100 ft. rolls or our PRE-CUT KITS. If you already sell and install window film, adding Invisi-Film Tough Coat Paint Protection to offer your customers is a great way to build your business. Covering the vulnerable front surfaces of the car with an invisible barrier will help retain the vehicle’s great looks and resale value. One of the toughest paint protections on the market, Invisi-Film provides superior invisible protection, unrivaled durability, total ease of installation and a boost to your bottom line. 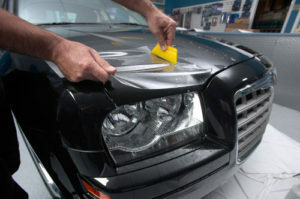 Its durable topcoat offers the ultimate defense against scratches, road debris and the acid that comes from dead bugs. 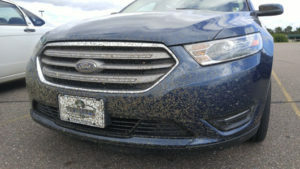 Insect splatter is highly acidic and will eat into your paint, if left untreated! We make it even easier to sell with a complete line of marketing and promotional materials and a 7-year manufacturer warranty. Protect your windshield – Driving on today’s highways can be hazardous, especially on your vehicles windshield. But now, you can protect your glass with ClearPlex Invisible Windshield Protection Films. Clear Plex film is the first and only optically clear protection film for vehicle windshields. The patented product absorbs the impact of standard road hazards, significantly reducing the occurrence of rock chips, stars, pitting and bullseyes, leaving the glass in pristine condition. Clear Plex film is a whole new vision in windshield protection. The film is guaranteed not to peel, bubble, crack or yellow. It will provide virtual invisibility for the warranted life of the film. ClearPlex film is designed to take whatever the road dishes out. Impacts which shatter unprotected glass leave only a minimal pin point on the film, preserving its optical clarity. Like glass, ClearPlex film is scratch resistant and stands up to everyday abrasions including windshield wipers.